Our Silk flower swag collection is available for sale. Free shipping. Dainty berries mixed with vibrant red geraniums. The blooming geraniums burst intermixed with a variety of green leaves for a textured and lifelike arrangement. 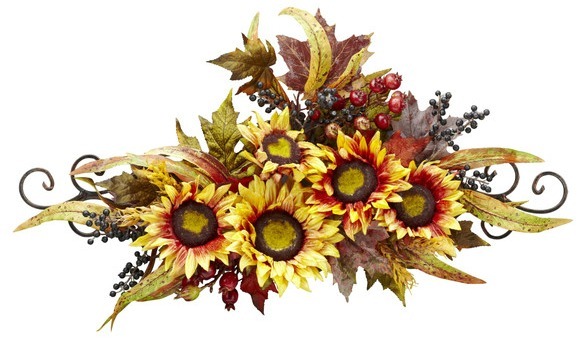 Beautiful sunflower swag with brilliant bursts of yellow and just the right touch of red and brown. Comes with a metal frame for added elegance. 30" Green and Pine Swag. Brown, bumpy faux pine cones come intertwined with pine greenery to create a crisp-looking decoration that will freshen up any room.